Just sent you another batch of photos - this time bombers (Did you get all the USAF fighters and T-33s OK?). *1951: USAF 29th AMS (29th AMG). *1952: FTD Wright-Patterson AFB, OH. *1952: USAF 84th BS (47th BG). 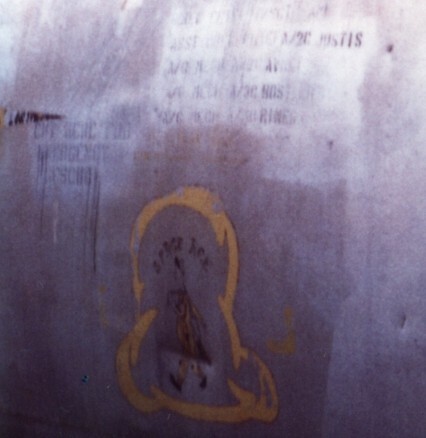 * Carried nose art and name Space Ace. *Assigned to Naval Ordinance Station Indian Head, MD. Photo from Leon Cleaver (Woodsy Airfield) collection. Chris, I did indeed receive those pics. Thanks! w/o (aircraft not recovered) 13Aug60 with 541 hrs. w/o (aircraft not recovered) 12Aug57 with 184 hrs. I have a few more 'pre-62' A3D-2s up to 138976 which I'm currently going through and will try to post in the next few days. I note that some of the above have other units quoted against their 'Forgotten Jets' entries but the record cards do not show these. Scott WRG Editor Note: As I use the information I will turn it to blue to help me keep track of whats been done. Ahh... But looming on the horizon... Forgotten Props and Forgotten Rotors.... coming.... eventually. "Forgotten Turbos" might be a reasonable category as that would service as a useful reminder and list of those that were really neither jet nor prob (or, well, both jet and prop). Thought about that, but decided that Turboprops have props, even if jet powered. So I'm going to stick with the three sites... for now. Latest addition to the Forgotten Jets site. Broke the F-86 listings down by serial number and model. Should make it easier to navigate, especially on mobile. The A-4 Skyhawk section has been remodelled. Accepting information, corrections and service images for this aircraft model. Thanks for taking on the Forgotten Jets web site! It would have been a great shame to lose it. Here is some additional information for NAA F-86F-30-NA Sabre 52-4689. This is from the USAF Service Card. Delivered to USAF 22 Apr 1953. Thanks Dean, I will be updating this entry today.